If you bought some Argentinian yerba mate after I posted a story on Instagram where I was drinking it or after I posted this chicken and cilantro soup or yerba mate chocolate truffles with brewed yerba mate, I have a new recipe which can make use of it. 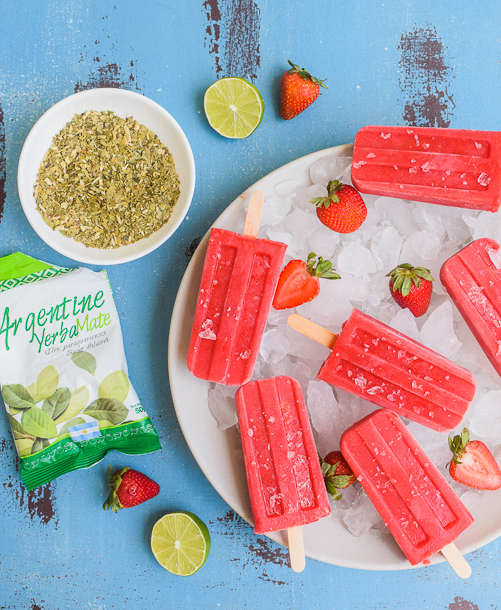 This recipe will also use Argentinian yerba mate in an unexpected way – this time in popsicles! 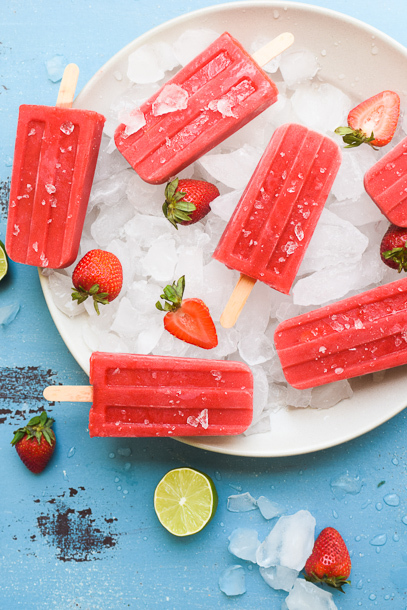 How refreshing do these strawberry popsicles look right about now? The inspiration for these popsicles came from my farmers market where there is a stand for iced Yerba Mate fruit beverages, like strawberry-lemonade, but with brewed Yerba Mate. It’s kind of like using iced black tea or iced green tea, but with yerba mate. Yerba mate has more of the grassiness of a green tea than the pungency of black tea. I think it goes really well with fruits. Yerba mate actually has more antioxidants than green tea and with the antioxidants in berries, these popsicles are perfectly good for you! You can find authentic Argentinian yerba mate online. Brands I like are Rosamonte and CBSe. On a side note, I was just looking at the ingredients on popsicle boxes at the market and I was astounded at what is in many of them. Popsicles should be straightforward – fresh fruit blended with water, coconut milk, yogurt, or in this case, brewed yerba mate tea. I cringe when I see added colors, flavors, thickening agents, high fructose corn syrup and other sources of sugars. And store bought ones are so expensive. You can make these for a mere fraction of the price. And most importantly, you can control the ingredients, especially the sugar content. I used raw honey, but add whatever your preferred sweetener is. You can also make these with different fresh fruits. There are so many options at this time of year. 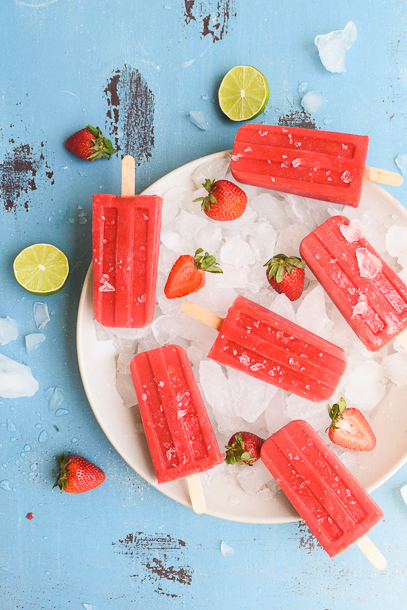 Here’s to eating healthy popsicles all summer long! Created in partnership with Argentinian Yerba Mate. Brew the yerba mate in the boiling water for 5 minutes. Strain the tea leaves and allow to cool slightly. Place the brewed tea and the rest of the ingredients into a blender and process until smooth, taste for sweetness and add more honey, if desired. Pour into popsicle molds, insert popsicle sticks and freeze until solid, about 2 hours. This looks great! A lot of the blogs focus on the preparation and benefits, but this definitely is a different take on Yerba and I would be glad to try this out! This is great!!! I love this! I was born in Argentina and raised on yerba! If you ever want to do a post on the traditional way to drink yerba, please let me know! Happy to send along a gourd! Thanks for your positive response! I actually have a gourd and drink yerba in the traditional way often! So healthy and it really makes me feel great! Can you recommend popsicle molds that you like?